So you've signed up for the Straits Times Run and the Standard Chartered Marathon Singapore (SCMS), and you're pumped up for these two large-scale running events. Different runners have different targets. You may be the fitness enthusiast aiming for a personal-best timing. Perhaps you are the overweight weekend warrior who wants prove that you can get back in shape. Maybe you just want to walk the entire distance for the fun of it; or perhaps you had stopped running years ago, started smoking and now have high blood pressure and diabetes, but still think you have what it takes to complete the race? Whatever your targets may be, you should go for pre-participation screening (PPS). Why is PPS important? It aims to detect heart conditions that are potentially life-threatening as they may lead to sudden death, especially during physical activity. A typical PPS is simple and straightforward, and is generally done before one participates in any sporting activity. You will be asked specific questions on your medical and family history, and whether you notice any symptoms while exercising. Blood tests such as fasting blood sugar levels and cholesterol may be done to help assess the risk of cardiovascular disease. There is also a brief physical examination which involves checking your pulse, blood pressure and listening to your heart sounds. Your heart's electrical rhythm will be assessed by capturing 10 seconds of your heartbeat via an electrocardiogram (ECG). PPS services are available in most hospitals in Singapore. It is performed by either a sports medicine physician or a cardiologist as they have the expertise to recognise abnormal features in the ECG. Over the years, there have been tragic incidents of sudden deaths during sporting events. While these occurrences are rare, they are usually due to previously unknown heart conditions and can happen to anyone. The conditions causing sudden cardiac death vary with different age groups. For those below 35 years old, abnormal heart muscle diseases and heart rhythm disorders are more common. In contrast, coronary artery disease is often the culprit for individuals above 35 years old. The hard truth is that up to 80 per cent of those who die suddenly do not have any warning symptoms nor family history of heart conditions. The first and only clue of an underlying heart problem is often the collapse itself. Thankfully the combination of a targeted questionnaire, physical examination and ECG in PPS has been shown to identify more than 90 per cent of potentially life-threatening heart diseases. Early detection is vital in avoiding tragedy as it allows for proper management of the condition, including avoiding vigorous exercise in some cases. In addition, should any component of the PPS be abnormal, further tests can be arranged. 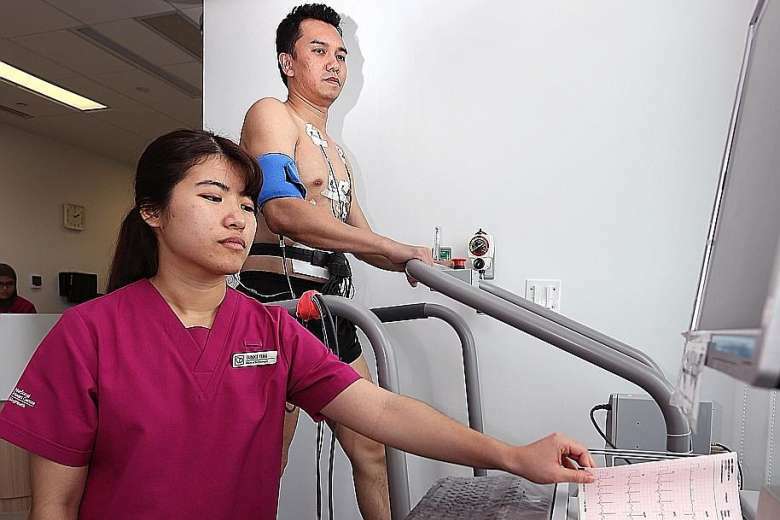 For instance, a treadmill exercise test to assess the heart's response to exercise can be done for older individuals with chest pain during running, or an echocardiogram to evaluate heart structures in younger runners with abnormal ECGs. PPS is a valuable resource that can be used for everyone participating in any level of sport, regardless of age, gender or fitness level. If you are one of the participants in the ST Run, SCMS or any sporting event, and have not been screened before, I encourage you to sign up for PPS.